As we shovel out from yet another dumping of the white stuff and the piles get higher and higher, I can’t help but wonder when, and if, spring will ever arrive. Well, eventually we know it will. A sure sign that we’re heading in the right direction is the arrival of seeds and packaged summer bulbs to our garden shop. Following a great event last month, Get the Jump on Spring, a few of the packaged bulb selections have already sold out for the season. Merci! I’d like to remind you that TBG members save 20 per cent when buying three or more bulb packages (mix and match). Seed sales have also been excellent and we’ve already placed a second order to top up our offerings. 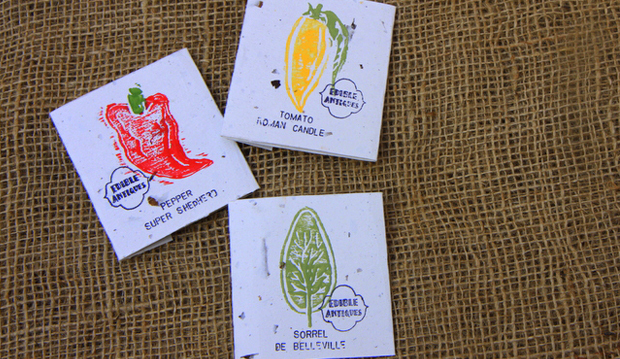 On the topic of seeds, I’d like to introduce you to an exciting new seed company.Last spring while doing a presentation in Prince Edward County, I came across a vendor selling eye-catching packages of seed. I first watched from a distance as the vendor spoke with such passion and enthusiasm about her product. When the opportunity arose, I made my way to her table and to have a closer look. This is when I met Stacey Hubbs, owner of Edible Antiques. We had a great conversation. At the end, Stacey made a few recommendations of her favourites and I left with a handful of treasures. Everything Stacey recommended grew beautifully. The Bronze Arrowhead lettuce looked amazing. Well, until the rabbits found it! 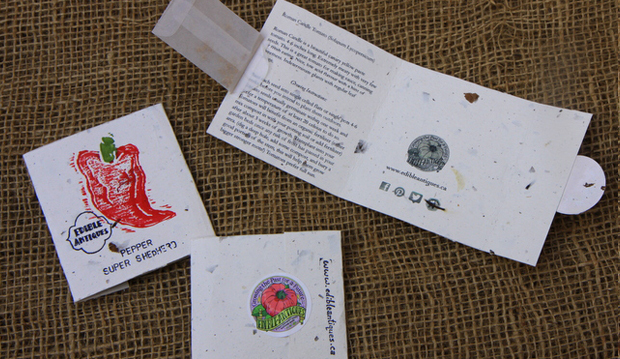 I was fascinated to learn that each package is handmade by Stacy, using biodegradable paper. The seed selections include open pollinated, non-gmo, non-patented, heritage and heirloom varieties that are grown in the Prince Edward County, Picton and Waupoos areas. Many of the seeds are grown by Stacey herself. The line of seeds will be launched and showcased in our booth at Canada Blooms, March 14 to 23. Following the show, we will carry the line in our garden shop, while supplies last. I hope you too will enjoy Stacey’s Edible Antiques seed line as much as I have.